Honor unveiled two wearable gadgets– Honor Watch Magic and Honor Band 4 Running that will be made available on the company’s official website and Amazon India. Honor, the smartphone e-brand under the Huawei Group, has unveiled two wearable devices — Honor Watch Magic and Honor Band 4 Running — along with Honor View 20 in India. These devices will be made available on the company’s official website and Amazon India. Honor Watch Magic and Honor Band 4 Running offer an array of features. Both devices target a different audience. Honor Watch Magic is a 9.8mm smartwatch. It is thinnest in its category and features a touch screen Retina AMOLED quality display. The watch has a dual-chipset processor and AI enabled low-energy algorithm to recognise the usage and pattern of the user to customize and save power. Honor claims the Watch Magic can deliver a week’s worth of battery life. Honor Watch Magic sports 3-satellite positioning for multiple sports mode, which helps achieve a faster and more accurate positioning. Honor Watch Magic also helps track daily activities, and monitor sleep quality and heart-rate. Honor Watch Magic is available in two colors Lava Black and Moonlight Silver priced at Rs 13,999 and Rs 14,999 respectively on Amazon India. The Honor Band 4 Running features a 0.5-inch PMOLED Display. It has a dual wearing mode (foot and hand) along with six-axis sensors to monitor and manage the running postures. It is available for Rs 1599. The Honor Band 4 Running offers seven types of fitness data ranging from Foot Strike Pattern & Impact, Swing Angle, Eversion Range, Step Length, Cadence and Ground Contact Time. 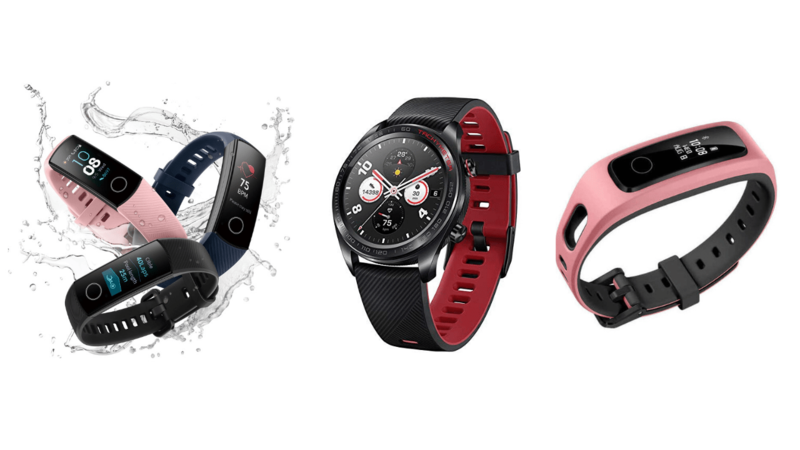 The Honor Band 4 is also water-resistant and can be used to track swimming.